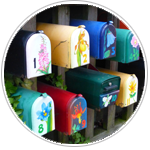 De-duplication: Failing to eliminate duplicates from your mailings can be costly. Postal Qualification helps save money and reduced returned mail. Convert rural routes to street addresses. Maintain file integrity; helps to keep your address file as accurate as possible. Correct addresses increase response rates. Update addresses of those people or businesses on your database that have recently moved. Standardize addresses to make your databases more deliverable. The next generation of change of address software, NCOA replaces the current NCOA service to provide change of address information. The USPS has used new secure data storage technology to develop and implement NCOA. This new technology to protect the privacy of consumers who file a change of address with the United States Postal Service. Enhance your Email Marketing List with Postal Addresses to start marketing to them via direct mail. DatabaseUSA.com postal appending (also known as Reverse Appending) adds postal addresses to your existing email address database. Convert single-channel customers to valuable multi-channel customers, merge records and transaction histories of your email and postal files, and target advertising to customers and prospects via zip codes. DatabaseUSA.com has the highest quality data and the highest phone append match rates – typically over 60% for B2B. Improve your telemarketing efforts with telephone number verification or append services. Append both residential and business telephone numbers to your customer and prospect lists in batch or real-time. All we need is name and mailing address information. Break through barriers to connect and captivate. Leverage our data to engage via email, postal, at work, at home, or LinkedIn. Hold their attention so you can intelligently and quickly establish credibility and relevance. Do Not Call/Scrubbing: We can scrub consumer telephone numbers against the National Do Not Call list as well as any state specific Do Not Call lists so you are fully compliant with the applicable statutes and laws. Complete the form or call us at 877.407.0101 for more information on our Postal Processing Services.